Seasonal snow is an important part of Earth's climate system. Snow cover helps regulate the temperature of the Earth's surface, and once that snow melts, the water helps fill rivers and reservoirs in many regions of the world, especially the western United States. In terms of area, snow cover is the largest single component of the cryosphere, covering an average of about 46 million square kilometers (about 17.8 million square miles) of Earth's surface each year. 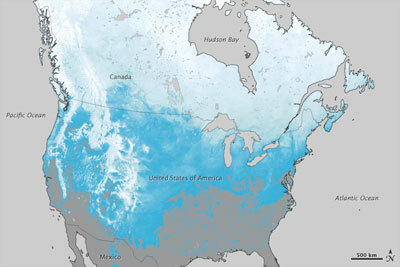 About 98 percent of the Earth's snow cover is located in the Northern Hemisphere. On such a large scale, snow cover helps regulate the exchange of heat between Earth's surface and the atmosphere, or the Earth's energy balance. On a smaller scale, variations in snow cover can affect regional weather patterns. For instance, in Europe and Asia, the cooling associated with a heavy snowpack and moist spring soils can shift the arrival of the summer monsoon season and influence how long it lasts. Snow's albedo, or how much sunlight it reflects back into the atmosphere, is very high, reflecting 80 to 90 percent of the incoming sunlight. By contrast, trees, plants, and soil reflect only 10 to 30 percent of sunlight. Snow cover wields the largest influence during springtime (April to May) in the Northern Hemisphere, when days become longer and the amount of sunshine increases over snow-covered areas. Snow's high reflectivity helps Earth's energy balance, because it reflects solar energy back into space, which helps cool the planet. The thermal properties of snow have important consequences for climate, as well. Snow acts like an insulating blanket. Beneath just 30 centimeters (1 foot) of snow, the soil and the organisms within it are protected from changes in the air temperature above the snow surface. Snow's cold, moist surface influences how much heat and moisture circulate between the ground and the atmosphere. Snow helps insulate the ground below, holding in heat and preventing moisture from evaporating into the atmosphere. Even on top of other frozen material, such as permafrost and river ice or sea ice, snow cover prevents ice from forming as quickly. When soil does freeze, it locks in gases like carbon and methane, inhibiting chemical exchanges between the ground and air. Frozen soil also inhibits the movement of water within the soil and on the soil surface. Because the soil is frozen, its surface is sealed over and so it absorbs less new liquid water, leading to more surface runoff. In addition, once soil has frozen, snow's insulating qualities can delay melting. Knowing whether soil is frozen, and knowing how soon that soil may thaw, is important in estimating how much water might be available during the spring and summer melt. Changes in climate can affect how much snow falls and influence the timing of the winter snow season. Between 1966 and 2010, the amount of land and sea ice that is snow-covered each year has decreased over many Northern Hemisphere regions, especially during the spring snowmelt season. Scientists are modeling how Earth's climate might change over the next 100 years, and the results suggest that snow will cover less of the planet, particularly over Europe and Asia. Climate warming can reduce snowfall, and cause earlier spring melts and shorter snow cover seasons. For instance, warmer air in Alaska has caused the snow to melt earlier each spring, lengthening the snow-free summer season. 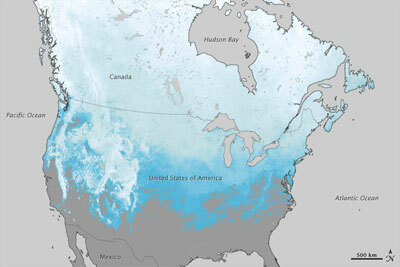 After the snowier winter of 2010-2011 (top image), much of North America received less snow during the winter of 2011-2012 (bottom image). Less snow often results in fewer springtime floods, but also means there will be less melt water to fill reservoirs and lakes. These maps were compiled using data from the Moderate Resolution Imaging Spectroradiometer (MODIS) instrument aboard the NASA Terra satellite. Warm periods of spring-like weather during winter may also cause rainfall instead of snowfall, or force unusual melting during a normally cold season. Warmer spring weather in Alaska and in the Canadian Arctic areas has caused more frequent melting and refreezing of snow, as well as more frequent rainfall. This extra water may seem beneficial for vegetation, and consequently for grazing animals. But nighttime temperatures during the Arctic springtime are still low enough to freeze the rain and melted snow, which seals the ground beneath a sheet of ice. Musk oxen and caribou can sweep snow off in order to graze, but they risk starvation when they are unable to break through hardened ice to reach the grass below. Changes in the amount of snow covering the ground, and changes in how the snow melts in the spring, will affect the water supplies that people use for things like farming and making electricity. Retreating glaciers and decreasing snowpack are prompting concerns about dwindling water supplies throughout India and southwest Asia. Ski resorts located in temperate mountain ranges, like those located in western North America, New Zealand, and the European Alps, already experience winter temperatures that are only slightly below freezing, and even a small increase in air temperature may shorten the ski season, or cause complete ski area closures. In fact, Bolivia's only ski resort, located on Chacaltaya Glacier, closed in 2009 after the glacier retreated for two decades, then disappeared altogether. Because changes in snowpack can have dramatic consequences for Earth's environment and for people, scientists have developed ways to continuously measure how much of the planet is covered by snow. Over the long term, this record of snow cover will help scientists understand how climate may be changing, and in the short term, this information can help water managers assess whether each winter's snowmelt will provide enough water to thirsty people and dry crops.